Family Pawn is a family owned and operated pawnshop. Our store is clean, comfortable and friendly, with a great selection, great deals, and fast easy loans. Family Pawn is a pawnshop that will appeal to everyone! Did you know Family Pawn will loan you money? 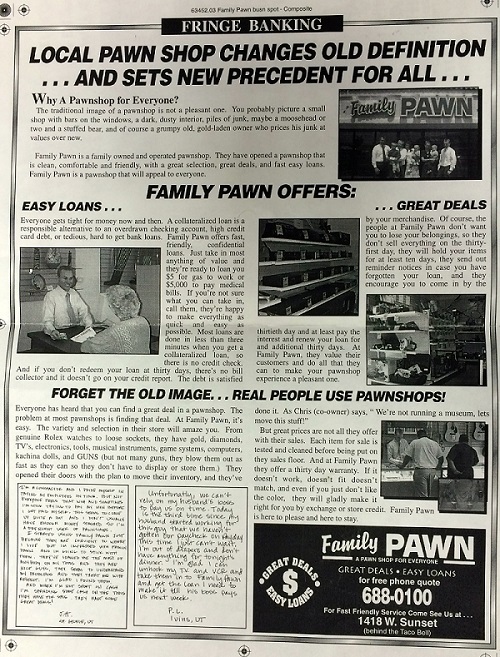 Family Pawn is a pawnshop for everyone. When you need a little extra cash to get by, bring in your tools or electronics, your jewelry or guns, or bring in your boat, jet skis, horse trailer, or other large items. With our on site storage lot, you can use anything of value to raise the money you need. When you choose Family Pawn, not only will you leave with cash in hand, but you’ll also have peace of mind knowing your property is being stored in a well-protected and secure facility. Let Family Pawn take care of you. We offer collateralized loans, auto loans, title loans as well as offering a place to purchase things you need at a value. Come see us at one of our locations! Great staff! I would recommend anyone check it out – Jon W.
Who wants to walk into a pawn shop and feel they have to take a shower afterward? Neither did we! 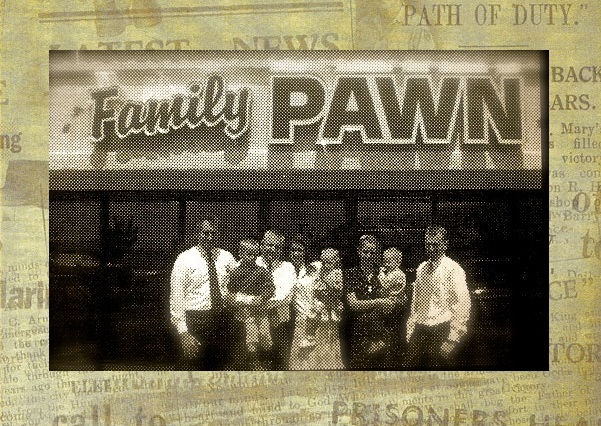 So in 1997 with the innovative concept of creating a pawn shop where the atmosphere was family friendly and the customers were treated fairly, Family Pawn was born. Because of the hardworking employees we have had through the years and the experience we give our customers, we have grown from the small store we started almost 20 years ago into four stores throughout Southern Utah. You can find us near your neighborhood with two stores in St. George, one in Washington, and our newest store in Hurricane. We live here and we have raised our kids here, we value our community and we value you our customer. So stop in today and give us a chance to earn your business here at Family Pawn, a pawn shop for everyone! Did you know that some governments own and run pawnshops within their country? The need for quick, easy cash loans is recognized worldwide. And in many countries the local governments have stepped in to help fill the void between the great need for small cash loans and the difficulty in getting such loans from a bank. Government owned pawnshops play an important economic role in places such as Italy, France, and most of Europe, Mexico, Thailand, the Philippines, and many Asian countries. Did you know that the popular children’s tune, Pop Goes the Weasel is actually about pawnshops? In 1853 W. R. Mondale, a British commentator wrote the poem as an illustration of the day-to-day struggle of making ends meet. A penny for a spool of thread, a penny for a needle That’s the way the money goes, pop goes the weasel! Pop was the English slang for pawn. Potatoes for an Irishman’s taste, a doctor for the measles A Fiddler always for a dance, pop goes the weasel! A weasel was a flat iron common in most homes of that day and easy to pawn. Did you know that a pawnshop nearly financed the discovery of America? In 1492 a desperate Christopher Columbus made a final appeal to Queen Isabella of Portugal, beseeching her to finance his voyage across the Atlantic to find the West Indies. She answered saying: “I will assume the undertaking for the crown of Castille, and am ready to pawn my jewels to defray the expense of it, if the funds in the treasure prove insufficient.” King Ferdinand stepped in and funded the venture from the treasury and Queen Isabella kept her jewels handy for the next emergency. As Queen Isabella knew, property with value is like cash in hand. Whether you’re setting off to discover a new country or just need gas money to get to work, bring in your family jewels or anything else of value to Family Pawn. We’ll help you get it done.